You know when they say, "always make time for yourself," Oh boy were they right. I'm juggling 2 jobs and school as of right now. At an orientation I had for school, they kept on emphasizing how important it is to have time for yourself. They said that with how busy everything it will be in class we need to remember to pause, and breathe. I didn't quite grasp the concept. I think I've always been addicted to hectic. I like it when I'm running around trying to get things done. I like being busy with actual productive things. It gives me a sense of purpose. But with all the things on my to do list, there are just those days when I feel like I want to pull my hair out. This is when those "breathers" come in handy. We all use our me time differently, I can't even say that I use my me time all the same way. Some instance I enjoy my me time cleaning the house, or reading a book, or shopping. 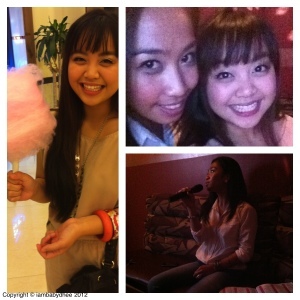 Last Friday, I decided to use my me time to hang out with one of my closest friends. We ate at an all you can eat buffet. It was awesome! I mean I know were trying to watch our figures, but believe me when I say that he doesn't get fat. lol. I on the other hand have to burn them crab legs I pigged out on. After that we went to a Karaoke place. It wasn't really a bar, because you get your own room, it's not like you go up on stage to sing. Anyway, exciting news!! We got 40% off of our bill from that Karaoke place. My "big sister" said it was because we were charming and beautiful. Lol. Oh yeah. My closest friend is who I call my fake big sister. I think we can pass as real sisters though. I had so much fun. It was a great way to remind myself to still have a good time.